You might have noticed that hipster eyeglass emporium Warby Parker took over the former Lascoff Drugs store on Lexington Avenue and East 82nd Street. The community is quite satisfied with their thoughtful reuse of the historic pharmacy, and in return, the company seems to be very in tune with the neighborhood of their latest outpost. 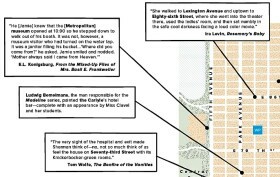 Warby’s latest foray into the world of the Upper East Side is a map of famous literary locations, from the Barbizon Hotel, fictionalized as the Amazon in Sylvia Plath’s The Bell Jar, to Eloise’s home at the Plaza Hotel.